Water pours into a cup at about the same rate regardless of whether the water bottle is made of glass or plastic. 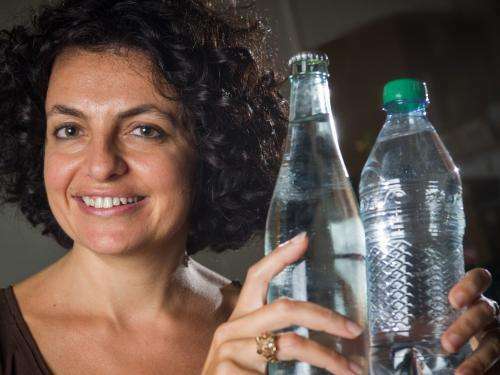 But at nanometer-size scales for water and potentially other fluids, whether the container is made of glass or plastic does make a significant difference. A new study shows that in nanoscopic channels, the effective viscosity of water in channels made of glass can be twice as high as water in plastic channels. Nanoscopic glass channels can make water flow more like ketchup than ordinary H2O. The effect of container properties on the fluids they hold offers yet another example of surprising phenomena at the nanoscale. And it also provides a new factor that the designers of tiny mechanical systems must take into account. "At the nanoscale, viscosity is no longer constant, so these results help redefine our understanding of fluid flow at this scale," said Elisa Riedo, an associate professor in the School of Physics at the Georgia Institute of Technology. "Anyone performing an experiment, developing a technology or attempting to understand a biological process that involves water or another liquid at this size scale will now have to take the properties of surfaces into account." Those effects could be important to designers of devices such as high resolution 3D printers that use nanoscale nozzles, nanofluidic systems and even certain biomedical devices. Considering that nano-confined water is ubiquitous in animal bodies, in rocks, and in nanotechnology, this new understanding could have a broad impact. Research into the properties of liquids confined by different materials was sponsored by the Department of Energy's Office of Basic Sciences and the National Science Foundation. The results were scheduled to be reported September 19 in the journal Nature Communications. The viscosity differences created by container materials are directly affected by the degree to which the materials are either hydrophilic—which means they attract water—or hydrophobic—which means they repel it. 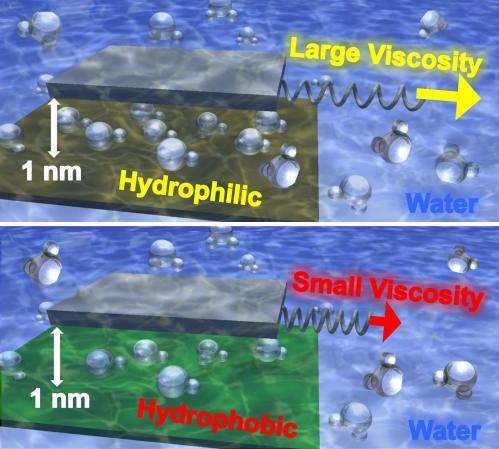 The researchers believe that in hydrophilic materials, the attraction for water—a property known as "wettability"—makes water molecules more difficult to move, contributing to an increase in the fluid's effective viscosity. On the other hand, water isn't as attracted to hydrophobic materials, making the molecules easier to move and producing lower viscosity. In research reported in the journal, this water behavior appeared only when water was confined to spaces of a few nanometers or less—the equivalent of just a few layers of water molecules. The viscosity continued to increase as the surfaces were moved closer together. The research team studied water confined by five different surfaces: mica, graphene oxide, silicon, diamond-like carbon, and graphite. Mica, used in the drilling industry, was the most hydrophilic of the materials, while graphite was the most hydrophobic. "We saw a clear one-to-one relationship between the degree to which the confining material was hydrophilic and the viscosity that we measured," Riedo said. Experimentally, the researchers began by preparing atomically-smooth surfaces of the materials, then placing highly-purified water onto them. Next, an AFM tip made of silicon was moved across the surfaces at varying heights until it made contact. The tip—about 40 nanometers in diameter—was then lifted up and the measurements continued. As the viscosity of the water increased, the force needed to move the AFM tip also increased, causing it to twist slightly on the cantilever beam used to raise and lower the tip. Changes in this torsion angle were measured by a laser bounced off the reflective cantilever, providing an indication of changes in the force exerted on the tip, the viscous resistance exerted—and therefore the water's effective viscosity. "When the AFM tip was about one nanometer away from the surface, we began to see an increase of the viscous force acting on the tip for the hydrophilic surfaces," Riedo said. "We had to use larger forces to move the tip at this point, and the closer we got to the surface, the more dramatic this became." Those differences can be explained by understanding how water behaves differently on different surfaces. "At the nanoscale, liquid-surface interaction forces become important, particularly when the liquid molecules are confined in tiny spaces," Riedo explained. "When the surfaces are hydrophilic, the water sticks to the surface and does not want to move. On hydrophobic surfaces, the water is slipping on the surfaces. With this study, not only have we observed this nanoscale wetting-dependent viscosity, but we have also been able to explain quantitatively the origin of the observed changes and relate them to boundary slip. This new understanding was able to explain previous unclear results of energy dissipation during dynamic AFM studies in water." While the researchers have so far only studied the effect of the material properties in water channels, Riedo expects to perform similar experiments on other fluids, including oils. Beyond simple fluids, she hopes to study complex fluids composed of nanoparticles in suspension to determine how the phenomenon changes with particle size and chemistry. "There is no reason why this should not be true for other liquids, which means that this could redefine the way that fluid dynamics is understood at the nanoscale," she said. "Every technology and natural process that uses liquids confined at the nanoscale will be affected." More information: Deborah Ortiz-Young, Hsiang-Chih Chiu, Suenne Kim, Kislon Voitchovsky and Elisa Riedo, "The interplay between apparent viscosity and wettability in nanoconfined water, Nature Communications, 2013.